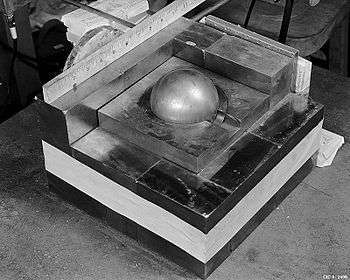 As part of a re-creation of a 1945 criticality accident using the Demon core; a plutonium pit is surrounded by blocks of neutron-reflective tungsten carbide. The original experiment was designed to measure the radiation produced when an extra block was added. Instead, the mass went supercritical when the block was placed improperly by being dropped. A numerical measure of a critical mass is dependent on the effective neutron multiplication factor k, the average number of neutrons released per fission event that go on to cause another fission event rather than being absorbed or leaving the material. When k = 1, the mass is critical, and the chain reaction is barely self-sustaining. A supercritical mass is one where there is an increasing rate of fission. The material may settle into equilibrium (i.e. become critical again) at an elevated temperature/power level or destroy itself, by which equilibrium is reached. In the case of supercriticality, k > 1. The mass where criticality occurs may be changed by modifying certain attributes such as fuel, shape, temperature, density and the installation of a neutron-reflective substance. These attributes have complex interactions and interdependencies. This section explains only the simplest ideal cases. If the perfect quantity of fuel were added to a slightly subcritical mass, to create a barely supercritical mass, the temperature of the assembly would increase to an initial maximum (for example: 1 K above the ambient temperature) and then decrease back to room temperature after a period of time, because fuel consumed during fission brings the assembly back to subcriticality once again. A mass may be exactly critical at a particular temperature. Fission and absorption cross-sections increase as the relative neutron velocity decreases. As fuel temperature increases, neutrons of a given energy appear faster and thus fission/absorption is less likely. This is not unrelated to Doppler broadening of the U238 resonances but is common to all fuels/absorbers/configurations. Neglecting the very important resonances, the total neutron cross section of every material exhibits an inverse relationship with relative neutron velocity. Hot fuel is always less reactive than cold fuel (over/under moderation in LWR is a different topic). Thermal expansion associated with temperature increase also contributes a negative coefficient of reactivity since fuel atoms are moving farther apart. A mass that is exactly critical at room temperature would be sub-critical in an environment anywhere above room temperature due to thermal expansion alone. In a bomb, a dense shell of material surrounding the fissile core will contain, via inertia, the expanding fissioning material. This increases the efficiency. A tamper also tends to act as a neutron reflector. Because a bomb relies on fast neutrons (not ones moderated by reflection with light elements, as in a reactor), because the neutrons reflected by a tamper are slowed by their collisions with the tamper nuclei, and because it takes time for the reflected neutrons to return to the fissile core, they take rather longer to be absorbed by a fissile nucleus. But they do contribute to the reaction, and can decrease the critical mass by a factor of four. Also, if the tamper is (e.g. depleted) uranium, it can fission due to the high energy neutrons generated by the primary explosion. This can greatly increase yield, especially if even more neutrons are generated by fusing hydrogen isotopes, in a so-called boosted configuration. The critical size is the minimum size of a nuclear reactor core or nuclear weapon that can be made for a specific geometrical arrangement and material composition. The critical size must at least include enough fissionable material to reach critical mass. If the size of the reactor core is less than a certain minimum, fission neutrons escape through its surface and the chain reaction is not sustained. The shape with minimal critical mass and the smallest physical dimensions is a sphere. Bare-sphere critical masses at normal density of some actinides are listed in the following table. The critical mass for lower-grade uranium depends strongly on the grade: with 20% U-235 it is over 400 kg; with 15% U-235, it is well over 600 kg. where the factor f has been rewritten as f' to account for the fact that the two values may differ depending upon geometrical effects and how one defines Σ. For example, for a bare solid sphere of Pu-239 criticality is at 320 kg/m2, regardless of density, and for U-235 at 550 kg/m2. In any case, criticality then depends upon a typical neutron "seeing" an amount of nuclei around it such that the areal density of nuclei exceeds a certain threshold. Several uncertainties contribute to the determination of a precise value for critical masses, including (1) detailed knowledge of cross sections, (2) calculation of geometric effects. This latter problem provided significant motivation for the development of the Monte Carlo method in computational physics by Nicholas Metropolis and Stanislaw Ulam. In fact, even for a homogeneous solid sphere, the exact calculation is by no means trivial. Finally note that the calculation can also be performed by assuming a continuum approximation for the neutron transport. This reduces it to a diffusion problem. However, as the typical linear dimensions are not significantly larger than the mean free path, such an approximation is only marginally applicable. A theoretical 100% pure Pu-239 weapon could also be constructed as a gun-type weapon, like the Manhattan Project's proposed Thin Man design. In reality, this is impractical because even "weapons grade" Pu-239 is contaminated with a small amount of Pu-240, which has a strong propensity toward spontaneous fission. Because of this, a reasonably sized gun-type weapon would suffer nuclear reaction (predetonation) before the masses of plutonium would be in a position for a full-fledged explosion to occur. 1 2 3 4 Nuclear Weapons Design & Materials, The Nuclear Threat Initiative website. 1 2 3 Final Report, Evaluation of nuclear criticality safety data and limits for actinides in transport, Republic of France, Institut de Radioprotection et de Sûreté Nucléaire, Département de Prévention et d'étude des Accidents. 1 2 3 http://typhoon.tokai-sc.jaea.go.jp/icnc2003/Proceeding/paper/6.5_022.pdf Dias et al.